We started out on the Oregon Trail a few days ago. The first few days were great! Everyone was very optimistic. We are ready to start a new life in our new place. I was afraid it would be hard to keep the kids in line by myself, but I am very proud of them, because it has been 4 days already and they haven't complained once. Although the first two days were fine and we didn't encounter any problems, today we came upon our first problem: crossing the river. Our wagon train leader thought he found a safe place to cross, but I wasn't so sure. It would be a shame to have our wagon fall over. Luckily, there was a nice Indian who offered to take us across the river on a ferry. It would cost me $25, but I figured it was the safest option. 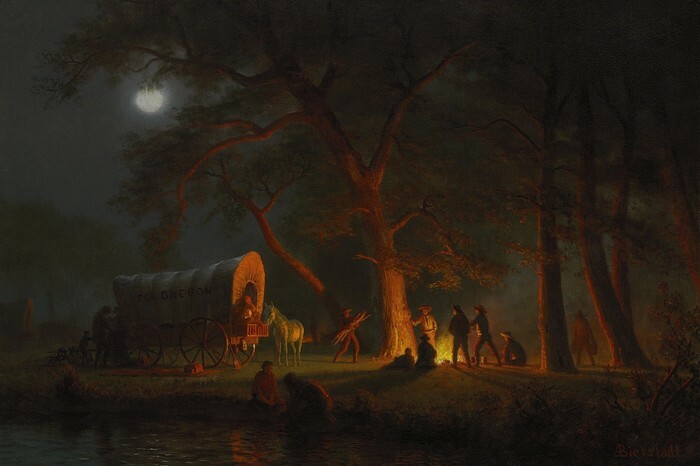 Everyone in my wagon train used the ferry to cross, and we crossed safely. We set off again this morning, still feeling optimistic, but slightly afraid of what was to come. We encountered a second river today. As we are coming up on more dangerous and isolated land, the rivers are more dangerous. Again our wagon leader thought he found a safe place to cross, but I was still unsure. Just to be safe, I payed $45 for the Indian to take me and my children across on the ferry. This time, two men from our wagon train and their families decided to try and cross the river themselves. The rest of us were afraid they wouldn't make it, but they ended up crossing safely. We came across a fork in the road at the end of the day. There were two trails: the Cheyenne River Trail and the Ancient Burial Ground Trail. The burial trail was a shorter route to our destination, but the Indian warned of us the dangers we might encounter from taking that trail. He said that that trail could be dangerous because it passed onto ancient Indian burial grounds. Also, this trail might not have enough drinkable water, and that could be a problem. 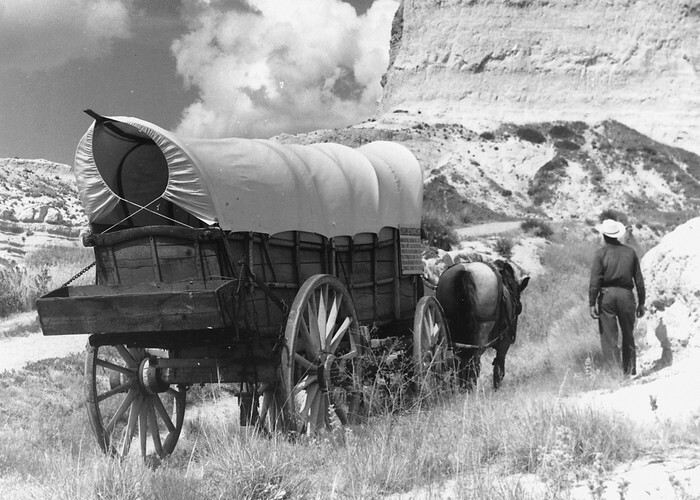 Based on these facts, our wagon train decided to take the Cheyenne River Trail because it seemed safer. As we started out on the trail this morning, everything seemed very peaceful. So far, the Cheyenne River Trail had provided us with enough food and (even though one of the wagons in our wagon train didn't even bring a water barrel) water. We saw a group of Indians approach our wagon ahead, and we stopped to talk to them. They told us they would like to trade and offered us some good deals. Having all the supplies we needed, we denied their offer. The Indians then asked us if we had a big heart, and we said yes, so they gave each of our wagons a baby to adopt. I named mine Pocahontas. As we continued on the trail, we eventually ran low on water. We came across a stream that had mucky water. Our only option was to try to filter it. One man stepped forward and claimed he knew the correct way to filter water. None of us knew how to do this correctly, so we had no choice but to trust him. He taught us how he said it was done correctly, but it was not filtered correctly. Six people from our wagon train ended up with cholera from the contaminated water. We were not able to treat them in time, resulting in the first deaths of the adventure. Of these unfortunate children was my own little Jeremiah. We buried the children that had died, and took only a few moments to say goodbye before we had to move on. This incident was tragic for many people in the wagon train, and for many days we thought of nothing but our beloved family members. I guess we all have to make sacrifices, but I hope I will not have to lose any more of my children.Everyone is very tired, frustrated, and upset about everything that has happened during this journey. The rest of the trip will not be very much better. In fact, I am afraid it might be even more dangerous. There is still much more to go, and it doesn't look any safer. I am very afraid for what is to come in the rest of this adventure. Today we are coming up on a dessert, and I fear we will run out of water again. After we crossed the dessert fairly safely, we came up to a mountain pass. It's very steep, and we must climb 2,000 feet to get to the top. Fearing that our wagons might tip over, our wagon leader instructs us to empty 500 BWU's from each of our wagons. This is most of my food and supplies. I only hope we will get to the new land soon so this journey will be over. We have to decide what to do. The journey took longer than expected so the pass might be closed, but we decide to take a chance and start for the pass anyway. When we get there, the pass is closed. We have no option but to try to wait out the winter. It is very cold and we have little food and water left. We tried to make a shelter to shield ourselves from the bitter cold and snow, but I still fear we will freeze to death. I am huddled together with my children. I am trying to be brave for them, but there is little hope of survival. Today I am feeling weaker than ever. I haven't had any food for a couple days, and then it was just the remains of a poor young woman from the wagon train. We have little food and water left that I try to save for my family. I feel like I can't even sit up, so I just lay in bed all day. My fingers have become frostbitten. I feel the end is near. Hysterical, my oldest daughter, Annabelle, tries to offer me her portion of food. She is not as sick as me, but still I refuse her offer. I know it's no use now. I at least want my children to survive and live to see a few more years. As my eyes start to close, I am grateful that I am not dying in vain. Meeker, Ezra. Map of Oregon Trail. Digital image. Wikimedia. Wikimedia Commons, 18 May 2005. Web. 9 Mar. 2015. <http://commons.wikimedia.org/wiki/File:Oregontrail_1907.jpg>. Covered Wagon. Digital image. Wikimedia. Wikimedia Commons, 2 May 2013. Web. 10 Mar. 2015. Bierstadt, Albert. Oregon Trail Painting. Digital image. Wikimedia. Wikimedia Commons, 20 Mar. 2012. Web. 10 Mar. 2015. <http://commons.wikimedia.org/wiki/File:Albert_Bierstadt_-_Oregon_Trail.jpg>.